Believe it or not this was actually designed this way on purpose. HOLY EFF. There's a button at the top of the screen that says "Next Picture" CLICK IT AND SEE WHERE IT GOES!!! ITS A CIRCLE. KILL IT. Well, I really hate the "it was designed this way dumbass"-comments. Isn't the whole point of the site to point out these things to people too, who might not have seen this earlier? 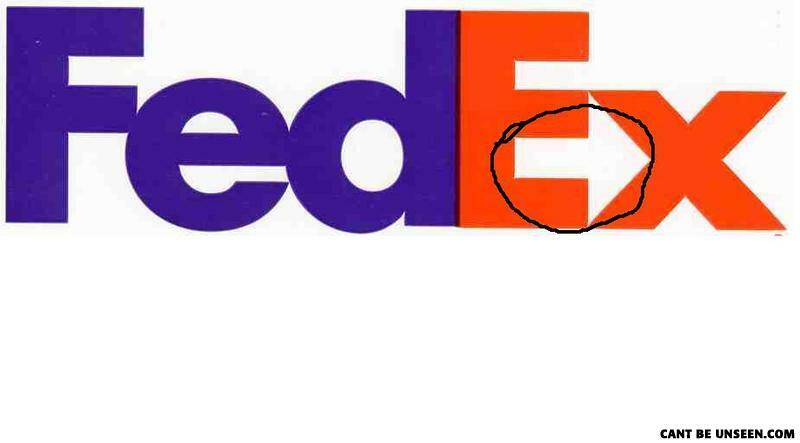 Actually it was an originally an accident and then the designer saw an arrow and modified the E and x so they matched up exactly. So was an accident that was caught and became on purpose. D: THAT WAS AWESOME, 1O YEARS AGO WHEN I FIRST SAW THAT. Also, there's a spoon in "fed"
OMG, and look! theres a circle in the d! Hmm... All I see is Guy Fawkes watching Willie Mays catch a fly ball while an armored assault vehicle rolls past. Also, said "spoon" looks more like a knife to me.